Buddy Blog! : Play with your food! Proving to the world that we eat plenty of fruit here at Buddy Systems, we just wrapped on a music video for the Nick Jr. show "Yo Gabba Gabba!" 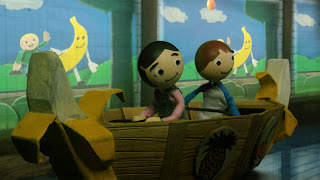 The video, titled Fruit Song, airs as part of the Green Episode. Thanks to all the nice folk at Nick for their support, and to the band YMCK for providing the awesome tune!